Learn English with us in Edinburgh, the inspiring capital of Scotland and you will find yourself immersed in a place where world-renowned heritage and culture meets a vibrant and cosmopolitan city, in a truly breathtaking setting! Edinburgh is a UNESCO world heritage site and one of the most beautiful and exciting cities in the UK in which to live. The city and surrounding "Lothians" is filled with iconic landmarks, rich, architectural heritage and medieval charm. You will be studying English in a world famous festival city, which hosts a huge number of major national and international arts festivals every year. You will be able to combine the bustle of the city and its attractions, activities and entertainment, with trips to the scenic surrounding countryside and stunning coastline of outstanding natural beauty. Edinburgh offers you a wonderful variety! The city is close to the sea and is spread over 7 hills, giving it the name "The Athens of the North". The medieval Old Town stretches along the Royal Mile, which gets its name due to having Edinburgh Castle at the top and Holyrood House Palace at the bottom. The breathtaking stone of Edinburgh Castle dominates the city-centre skyline, from where you can look down on cobbled lanes and elegant terraces, filled with cafes, restaurants and endless shopping possibilities! There is an enormous park in the centre of the city, where you will find Arthur´s Seat, an extinct volcano with more spectacular views. Crossing the wonderful Princes Street Gardens you arrive at the neoclassical New Town, which dates back to the 18th Century. As you explore the city you will discover wonderful architecture and pass by galleries displaying cutting edge art. This is a dynamic capital which attracts the world´s leading performers and at the same time the city is compact, safe and friendly and is a hub for educational and professional development, since the world-renowned University of Edinburgh was founded here in 1583. A perfect place to practise speaking English! With Edinburgh as your base you will also be able to explore many other parts of Scotland and England. Our English school in Edinburgh, established in 2002, is situated in the most prestigious area of the city, on George Street, just a couple of minutes walk from the beautiful city centre park - Princes Gardens. Waverley train station is a 10 minute walk from our school and all city shops and facilities are also right on the doorstep. 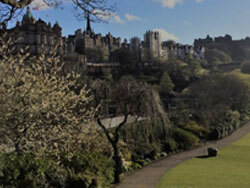 You will learn English in the heart of the city with magnificent views of Edinburgh Castle and the Old Town. Our Edinburgh language school offers you fantastic modern facilities, as the 14 classrooms all have interactive whiteboards and projectors and there is a multi-media centre with DVD players, laptops and a large selection of films, as well as large screen TVs with computer connectivity and WiFi. There is also an extensive library in the school and a common room with a flat screen TV and vending machines. You will be studying English with a wide-variety of learning materials, whilst the highly trained teachers endeavour to bring the outside world into the classrooms. Read on for further information on the courses and accommodation on offer in Edinburgh! It is possible to start on any Monday of the year and our school offers weekly progress tests to check your level. We offer a wide selection of English courses in Edinburgh for all students and at all levels. If you choose a Semi-Intensive, Intensive or Super-Intensive course you can select 15, 20, 25 or 30 classes per week. These courses are ideal for everyone. Each course will help you improve your general English language skills, including vocabulary, grammar, pronunciation, as well as your fluency in speaking, reading, writing and listening. These English courses are available at all levels from complete beginners (A1) to advanced level (C1) and you can simply decide the length of the course and how many hours per week you wish to study. There is a maximum of just 12 students per class, with highly qualified and attentive teachers. If you would like to enjoy a reduced class size of maximum 6 students only then choose the Mini-Group English Course instead. If you are looking for individual, tailored tuition then you can attend a course of Private Lessons with an independent learning plan tailored to your requirements. Our school also offers courses of 15 private classes per week, which can also be combined with another course of your choice, as you like. If you are planning to work in a career that requires a good command of English, then our Business English Course is ideal for you! In mini groups of just 4 students per class you will be able to improve every aspect of your language for a business environment. You will cover topics in sales, marketing, finance, management, human resources, to name just a few. You will need to have an upper-intermediate or advanced level (B2 - C1) of English to enrol for this course. Our academic IELTS course (International English Language Testing System) at our school helps prepare students to study at a British university or college. This course consists of 15 lessons each week to prepare you for the official exam, which is recognised all over the UK and in 8000 institutions all over the world! The IELTS course is for students who already have an intermediate level of English or above and consists of four parts: reading, writing, listening and speaking. All of our teachers are qualified to know how to prepare students for the examination. You can combine a Semi-Intensive course of 15 hours per week with 15 hours of IELTS preparation, for example. During September our school offers the Cambridge Exam Preparation Course in Edinburgh. This is a 6-week comprehensive course of either 15 or 20 lessons per week, guiding you to pass the globally recognised examination. Our qualified teachers have been preparing students for the Cambridge exams (CAE, CPE and FCE) for many years and will teach you the techniques necessary to pass the examination. You will also practise for the exams using real past-papers. You will need at least a B2 level of English and you can combine this course with another, if you wish to study longer in advance of the examination. Contact us for further information and exact start dates. We also teach teachers to teach at our school in Edinburgh! These courses are available to non-native Teachers of English who wish to refresh their teaching skills or learn new teaching methodology and share best practises, helping them achieve their full potential. During the week, after classes, our school encourages all the students to go out and to explore the city whilst using the English they’ve learned in real situations, boosting vocabulary, knowledge and confidence! For real insight into life in Edinburgh we recommend you to stay with one of our Host Families, either with breakfast included, or with breakfast and the evening meal (half-board). This is our most popular accommodation option, where you have the chance to constantly improve, build on and practise your English language skills, whilst making new and long-lasting friendships at the same time. You can choose a single room or a shared room with another international student. Our host families all live at a convenient distance from the school. For a more independent environment, or if you are looking to enjoy every aspect of student life, then you can select self-catering accommodation in a single room in one of our student residence buildings. This might be on the university residence campus, or in a shared house close to the city centre. There is a wide range of local shops and cafes close to our residence buildings and access to a fully-equipped kitchen so that you can prepare your own meals together or individually, as well as shared living area. You can also book accommodation in a hotel or guesthouse, or in a rented apartment. Please contact us for further details and options to suit your budget. This type of accommodation guarantees that you will have a private bathroom. Whilst studying in one of the finest cities in Europe, we encourage all students of English to make the most of all that Edinburgh has to offer! Our teachers aim to bring the outside world into the classrooms and likewise we hope that you will be able to use all the English you are learning when you are out in the city and surrounding area. The exciting social programme offered at our school reflects the culture and the history of Edinburgh, with visits and excursions to galleries, museums, theatres and you will also often be able to attend open lectures at the university. Our school arranges regular pub nights as part of their activity programme, as well as meals in nearby restaurants. Edinburgh is a safe and compact city, where you can join one of the dozens of famous festivals that take place during the year, take countryside walks in the nearby beautiful surrounding highlands, make trips to the coast, or take part in underground ghost tours of the city! Some of the activities on offer are included in your course fees whereas others are available for a small extra fee. Likewise, monthly day trips and other visits or excursions are organised at affordable prices. Edinburgh airport is located around 30 minutes drive from our school and there are endless international flight connections into the airport. We would be happy to arrange an airport transfer for you on your arrival, although this is not included in the course fees. If you are arriving in Edinburgh from another UK city then there are also extremely good road and rail connections, with Edinburgh´s largest train station - Waverley - within short walking distance from our school.